Sixty days have now passed since January 8, 2008, when the U.S. Department of the Interior failed to meet its legal deadline to determine whether the polar bear is endangered by global warming, triggering a joint lawsuit over this latest delay from the Center for Biological Diversity, NRDC, and Greenpeace, pursuant to the notice of intent filed in January. In the intervening months, U.S. Fish and Wildlife director Dale Hall took responsibility for the delay, but two weeks ago he told House appropriators that the decision had been given to Dirk Kempthorne, Secretary of the Interior, for final review. In addition, Rep. Ed Markey (D-Mass. ), chair of the House global warming committee, today introduced legislation to block further activity in the lease sale area. This legislation, which does not yet have a bill number, is a revision of his proposed legislation from January, before the lease sale took place. The amended legislation would now prevent the Secretary of the Interior from authorizing any “related activity (including approving any seismic activity, offering any new lease, or approving any exploration or development plan)” until an ESA determination and critical habitat designation is made. Chairman Edward J. Markey (D-Mass.) of the Select Committee on Energy Independence and Global Warming will question members of the Bush Administration regarding the delay of a decision to list polar bears under the Endangered Species Act until after a controversial lease sale for oil drilling off of Alaska. The hearing will also feature experts on wildlife protection and oil drilling. Earlier this week, the Interior Department announced it would miss the statutory deadline to reach a decision on listing the polar bear under the Endangered Species Act (ESA), saying it would take up to a month more to reach the decision. That would put the listing decision one day after the sale of oil drilling rights in Alaska’s Chukchi Sea, scheduled for February 6th. The Chukchi Sea is a sensitive polar bear habitat. In the most thorough study to date, the Interior Department determined that under current trends, disappearing sea ice would result in a two-thirds drop in the world population of polar bears resulting in the disappearance of polar bears from Alaska by 2050. 10:22 am Sensenbrenner What’s the beef? 10:22 am Inslee The idea that the science isn’t clear on what’s happening in the Arctic is bizarre. The ice is gone. I want to ask a question about oil spills. Luthi I don’t think we would be doing our jobs if we didn’t consider the possibility of a spill. The history has been different. The companies especially in north Alaska have been responsible. Inslee If I told you there was a 33-51% chance of being run over a bus I think that would be significant. Your statement said there would be a 33-51% chance of a 1000 barrel oil spill. Luthi Before the ESA kicks in, or if it does, we have worked with FWS very carefully. Inslee I believe you are acting in willful ignorance of known science. I believe it is negligent in the extreme. You moved before the ESA determination was made. I find that totally disrespectful of the law. Luthi What would be different would be one more layer of consultation under the ESA. The protections under the Marine Mammals Act are in many ways more strict. 10:29 Walden Do you have other endangered species listed where there is drilling? Luthi The eiders, and a whale species I believe. Walden Have you seen threats to these species or loss of life? Luthi We have seen no blowouts, very small spills. To my knowledge there has not been a take or harassment of endangered species. 10:34 Larson Doesn’t Rep. Markey’s legislation make sense? Hall Quite frankly, if I hadn’t made the decision to give ourselves more time it would have worked that way anyway. I’m never comfortable telling people what kind of laws they should pass. Larson Given the record low summer sea ice this year what are you doing to understand the impact on polar bears? Amstrup The work that we’ve done suggest that the changes in the sea ice have already negatively impacted the polar bears. 10:44 Hall The burden is on us and the science to determine a direct linkage between the take and the endangerment of the species. The science as it is today, even the IPCC information, would not allow us to segment out this particular set of emissions. 10:46 Cleaver Are you familiar with the USS Arizona? Went down in Pearl Harbor. Have you ever gone there to see the ship on the bottom? Each day when people go over it, the number one tourist attraction in Hawaii, oil is still bubbling up. Sixty years later. I watched it last week and realize the lasting impact of oil spills and what it does to the environment. I’m also wondering, do you think the FWS is strictly dealing with fish and wildlife, or does it get into ideological issues? Is it ideological or scientific or is it a mix of two? Hall Over my 29 years with the FWS I can speak with some confidence that our employees try to be professional and responsible. As far as being ideological I believe that the vast majority of employees and myself believe we should be advocates for truth. Cleaver So the polar bears, the habitat has been damaged. Hall We’ve certainly lost 20%. We know the habitat is leaving us. Cleaver So what’s the problem? Hall It’s not just making a decision that’s important. It’s making it clear, and why. When I release a document with my signature. Cleaver How much more habitat do we need to lose for this to be clear? Hall We need to do something about climate change starting yesterday. We need to control greenhouse gases. 10:53 Amstrup The declines in sea ice predicted haven’t been as fast as what has actually occured. Rep. Hall Can we quantify that? Luthi That comes from the Energy Information Agency. That’s what they tell us. Rep. Hall You can draw a graph that project different outcomes depending on different policies we adopt. Do we spend billions of dollars getting oil from unfriendly and dangerous places or do we invest in new technologies? You’re talking about a potential of $100 billion from a $500 million lease. Luthi The MMS takes very seriously its responsibility to get fair market value. 11:02 Markey What would be the effect of an oil spill be on polar bears? Amstrup It would depend on the oil spill, but the effect of oil on polar bears in the wild is to kill them. Markey Would you object if Sec. Kempthorne decided to allow Mr. Hall to make his decision before you were allowed to make the Chukchi sale? Luthi He is my boss. Markey We have political players confronting a scientific decision and the chief decisionmaker is Sec. Kempthorne. All he has to do is say, let’s use common sense, and recognize that extinction is forever, and make that decision before we send the oil and gas companies out. Mr. Kempthorne is to blame. In the end, man can adapt but the bear cannot. When the ice is gone, man cheers for new drilling opportunities, but the bear starves and dies. 11:07 Inslee This could result in a suicide squeeze for the polar bear. If the leases are made before the designation, you cannot terminate the leases legally, can you? Luthi We cannot terminate the leases, no. Inslee I can’t believe an agency would issue this document saying there’s a 33-51% chance of a major oil spill not taking into account existing technology. Hall We update the statistics based on new technology. The data reflects the past history. We used the best available information at the time. 11:18 Siegel There is still time to save the polar bear. A first step is to list the polar bear under the Endangered Species Act. We need to also immediately reduce greenhouse gases, not just carbon dioxide, but also methane and black carbon. 11:21 Williams We must delay the Chukchi lease sale. We must provide funding for polar bear study. We must reduce greenhouse gases. Congress would never make a decision without this kind of information. It is the worst kind of irresponsible. 11:29 Clark There are numerous factors that support listing polar bears under the ESA. Number one is the unequivocal loss of sea ice due to global warming. It would fly in the face of the precautionary principles of the ESA for the Interior to take advantage of its own delay in the listing to develop gas and oil drilling. On Monday the U.S. Fish and Wildlife Service announced it would miss today’s deadline on determining whether to list the polar bear as an endangered species due to global warming-induced polar sea ice loss. As noted in Hill Heat, last week the administration announced its intent to sell off-shore drilling rights in polar bear habitat off Alaska. Today the Center for Biological Diversity, NRDC, and Greenpeace announced they have filed a notice of intent to sue the administration. This would be the second lawsuit filed over FWS delays; in 2005 the Center for Biological Diversity v. Kempthorne lawsuit to compel the FWS to respond to the request to start the polar bear listing process (the FWS ended up taking two years instead of the Endangered Species Act-mandated 90 days). The U.S. Minerals Management Service (MMS) will hold its first federal Outer Continental Shelf oil and gas lease sale since 1991 on February 6. It is leasing nearly 46,000 square miles in the Chukchi Sea off the northwest coast of Alaska, with estimated conventional reserves of 15 billion barrels of oil. Waters within 25 miles of the coast are excluded from the lease area. This announcement comes just six days before the January 9 deadline for the U.S. Fish and Wildlife Service to decide whether to list the polar bear as endangered because of the global-warming induced decline of Arctic sea ice, some of which covers the Chukchi Sea. The sale area will not include nearshore waters ranging from about 25 to 50 miles from the coast, which includes the near-shore “polynya” through which the bowhead and beluga whales, other marine mammals, and marine birds migrate north in the spring, and in which local communities subsistence hunt. Leases issued from the sale will include stipulations to address environmental effects that may occur because of exploration and development of the area’s oil and gas resources. These stipulations call for protection of biological resources, including protected marine mammals and birds and methods to minimize interference with subsistence hunting and other subsistence harvesting activities. Environmental organizations are livid. The World Wildlife Fund published a series of statements from Alaska Wilderness League, Center for Biological Diversity, Audubon, and indigenous activists condemning the threat to the polar bear and other marine life from the planned sale. Lessees are advised that the U.S. Fish and Wildlife Service is proposing to list the polar bear (Ursus maritimus) as a threatened species under the Endangered Species Act and has initiated a comprehensive scientific review to assess the current status and future of the species. The FWS anticipates making a decision in early 2008 on whether to list polar bears under the ESA. 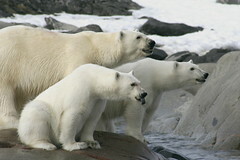 Please refer to http://alaska.fws.gov/fisheries/mmm/polarbear/issues.htm for additional information. If the polar bears are ultimately listed under the ESA, then MMS will consult with FWS under Section 7 of the ESA, and may be required to apply additional mitigation measures on OCS activities to ensure appropriate protection. Update: Sierra Club has launched a letter-writing campaign to “chill the drills” in what it calls the “Polar Bear Seas”. This forum was aired on C-SPAN. Is the Arctic sea ice cover melting faster than expected? If so, what are the contributing factors and why was the rate of melting unanticipated? How much sea ice cover has been lost in terms of extent and volume? What are the implications of both the loss of sea ice and the rate of loss? Is the Greenland ice sheet losing its mass faster than anticipated? If so, what are the contributing factors and why was the rate of loss unanticipated? What are the implications of continued accelerated ice loss from the Greenland ice sheet with respect to Sea Level Rise? Is the Antarctic Ice Sheet getting bigger or smaller and by how much and how fast? Are there parts of the Antarctic ice sheet that are gaining mass and parts that are losing mass? If so, what are the contributing causes? What are the implications of continued ice mass loss in Antarctica, especially the decay of ice shelves? Since the advent of routine monitoring via satellite in 1979, the area of the Arctic Ocean covered with sea ice, known as ice extent, has declined in all months, most strongly in September. The rate of ice loss appears to have accelerated in recent years. Sea ice extent for September 2007 was the lowest ever recorded, beating the old record set in September 2005 by 23%, an area the size of Texas and California combined. Essentially all state-of-the-art global climate models indicate that sea ice extent should be declining over the period of observations, pointing strongly to a role of increased greenhouse gas concentrations. However, the observed rate of decline in September exceeds that from nearly all models. While natural climate variability explains part of the observed rapid ice loss, it appears that the models, as a group, are underestimating the sensitivity of the ice cover to the effects of greenhouse warming. There is strong evidence that reductions in sea ice extent have been accompanied by substantial thinning. There is growing recognition that once the ice thins sufficiently, it will become sensitive to a “kick” from natural climate variations that, through feedback mechanisms such as ocean warming in ice free regions due to solar radiation, result in rapid loss of the remaining summer ice cover. Transition to an ice-free Arctic Ocean in summer could occur as early as 2030. While climate simulations suggest that ice loss may have impacts on weather patterns well beyond the Arctic, little is known at this time. While ice loss will have adverse ramifications for Arctic ecosystems and the peoples of the Arctic, given the current trajectory, the region will also become accessible to shipping and resource exploitation. The summer of 2007 saw the fabled Northwest passage open for the first time since regular monitoring began in 1972. Mass changes of the Earth’s ice sheets and glacier systems are of considerable importance because of their sensitivity to climate change and their contribution to rising sea level. Recent changes in the cryosphere highlight the importance of methods for directly observing the complex spatial and temporal variation of land ice mass flux. Since its launch in March of 2002, the NASA/DLR Gravity Recovery and Climate Experiment (GRACE) mission has been acquiring ultra-precise inter-satellite K-band range and range-rate (KBRR) measurements enabling a direct mapping of static and time-variable gravity. These data provide new opportunities to observe and understand ice mass changes at unprecedented temporal and spatial resolutions. Through the detailed reduction of these GRACE KBRR data, we have computed multi-year time series of surface mass flux for Greenland and Antarctica coastal and interior ice sheet sub-drainage systems as well as the Alaskan glacier systems. These mass flux solutions provide important observations of the seasonal and inter-annual evolution of the Earth’s land ice as well as overall trends. The gravity observations show the Greenland ice sheet is losing significant mass at the low elevation coastal regions that is not compensated for by gains in the high elevation interior resulting in an overall rate of loss of 154±10 Gt/yr. In addition strong inter-annual variations are observed such as the large mass loss of 2005 resulting from higher surface temperatures and a longer melt season. The gravity observations show the Antarctic ice sheet is losing mass at the rate of 105±30 Gt/yr with the loss concentrated from the western Antarctic ice sheet and in particular at the tip of the peninsula. The high elevation regions of the Antarctic ice sheet are showing no significant rate of change in mass. The Alaskan mountain glaciers are observed to be losing mass at a rate of 98±8 Gt/yr with the largest losses observed in the Yakutat Ice fields and Glacier Bay regions. The combination of GRACE high-resolution mass flux observations together with the surface elevation change and surface melt observations is beginning to reveal a detailed understanding of the Earth’s high latitude land ice evolution. Recent rapid changes in marginal regions of the Greenland ice sheet show mainly acceleration and thinning, with some glacier velocities increasing more than twofold. Recent data show a high correlation between periods of heavy surface melting and increase in glacier velocity. A possible cause is rapid melt water drainage to the glacier bed, where it enhances basal sliding. An increase in melt water production in a warmer climate could have major consequences on ice-flow rate and mass loss. Melt extent on the ice sheet for 2007 was the largest ever recorded since the beginning of satellite measurements in 1979, beating the old record set in 2005 by 10%, an area. The Greenland Ice Sheet is losing mass, and that this has most likely been accelerating since the mid 1990s. Although Greenland has been thickening at high elevations, because of the predicted increase in snowfall, this gain is more than offset by an accelerating mass loss, with a large component from rapidly-thinning and accelerating outlet glaciers. The mass balance decreased from near balance in the early 1990’s to minus 100 Giga tons (Gt) or even less than 200 Giga tons of ice for the most recent observations in 2006. The likely sensitive regions for future rapid changes in ice volume are those outlet glaciers in Greenland like the Jakobshavn Isbrae, with an over-deepened channel reaching far inland. Inclusion of these processes in models will likely demonstrate that the Intergovernmental Panel on Climate Change’s 4th Assessment (2007) Report underestimated sea-level projections for the end of the 21st Century. Dr. Mark Serreze received his BS and MS from the University of Massachusetts, Amherst, in 1982 and 1984, respectively. His MS work focused on the energy and mass balance of a small ice cap on Northern Ellesmere Island in the Canadian high Arctic. After a brief stay at the Lamont Doherty Environmental Observatory, he entered the PhD program within the Department of Geography at the University of Colorado, Boulder, graduating in 1989. His dissertation addressed Arctic sea ice circulation and its links with atmospheric variability. He is now a Senior Research Scientist at the National Snow and Ice Data Center, part of the Cooperative Institute for Research in Environmental Sciences at the University of Colorado. His early research focused on variability in Arctic weather patterns, and aspects of the Arctic’s hydrologic cycle. Over time it became increasing clear that the Arctic environment was rapidly changing, characterized by increases in surface air temperature, thawing of permafrost, and most notably, a shrinking sea ice cover. Dr. Serreze’s research over the past decade has largely turned to understanding these synergistic changes. Community service has included contributions to the National Science Foundation, the National Oceanographic and Atmospheric Administration, and the World Climate Research Programme. He is a member of the American Geophysical Union and the American Meteorological Society. As of October 2007, Dr. Serreze had authored or co-authored 84 publications in peer-reviewed journals and 8 book chapters. His textbook with Roger Barry, “The Arctic Climate System”, published in 2005 by the Cambridge University Press, won an award from the Atmospheric Science Librarians International. Scott B. Luthcke is a geophysicist at NASA Goddard Space Flight Center’s Planetary Geodynamics Laboratory. His research focuses on the reduction of satellite tracking and altimeter data for planetary science investigations. His recent research focuses on the recovery of local time variable gravity solutions for cryopsheric and hydrologic mass flux investigations. Scott is currently a member of the ICESat, GRACE and Jason-2/OSTM science teams and is a member of the American Geophysical Union. Scott has authored 25 scientific peer-reviewed papers including his recent paper on Greenland mass flux published in the November 24, 2006 issue of Science. He received a BS in Physics from the University of Maryland and an MS in Physics from the Johns Hopkins University. He has received the NASA/GSFC Exceptional Achievement award (2006) and the NASA/GSFC Honor Award in Earth Science (2007). Dr. Konrad Steffen received his education at the Swiss Federal Institute of Technology (ETH) in Zurich, Switzerland. He studied first electrical engineering and then graduated in natural sciences; with a master degree in 1977 on the climatology of the high Canadian Arctic, and a Ph.D. degree in 1983 on the climate impact of an ice free ocean. He s a Professor at the University of Colorado teaching climatology and remote sensing and his research involves the study of processes related to climate variability and change, cryospheric interaction in Polar Regions, and sea level rise based on in-situ measurements, satellite observations, and model approximations. He has lead field expedition to the Greenland ice sheet and other Arctic regions for the past consecutive 33 years to measure the dynamic response of the ice masses under a warming climate; since 1990 he established a climate monitoring network on the Greenland ice sheet with a total of 22 instrument towers transmitting data via satellite link every hour for process studies and model verification. He participated in the field measurements and first publication that proposed the dynamic response of the Greenland ice sheet to climate warming in 2002.His work has been featured by several TV stations and popular science paper. Dr. Steffen serves on a number of national and international committees, most notably he is the co-chair of the World Meteorological Organization (WMO) World Climate Research Program (WCRP) Climate and Cryosphere Program (CliC), the vice president of the IUGG Association of Cryospheric Sciences, the former vice president of the Commission for Snow and Ice for the International Association for Hydrological Sciences, a member of the subcommittee on Earth science to advise the NASA administrator, and he is leading the cryosphere chapter for the for the U.S. Climate Science Program, Synthesis and Assessment Product 3.4 on Abrupt Climate Change. Dr. Steffen is the director of the Cooperative Institute for Research in Environmental Sciences (CIRES), the largest research unit at the University of Colorado Boulder Campus. He has published over 75 scientific papers in peer-review journals, and 5 book chapters. Disappearing Polar Bears and Permafrost: Is a Global Warming Tipping Point Embedded in the Ice? On Wednesday, October 17, 2007, the Investigations and Oversight Subcommittee will hold a hearing on the impacts of global warming on the Arctic. This hearing will provide the Committee with an opportunity to hear from witnesses on three interrelated matters: (1) the current situation in the Arctic, including the situation facing the polar bear, (2) ways in which warming in the Arctic may accelerate global warming, especially through the emission of more greenhouse gases, and (3) interim steps that could be taken to reduce greenhouse gas emissions while the Congress weighs more elaborate carbon trade or tax proposals. One of the themes that should emerge from this hearing is that, from a layman’s perspective, the models used to project climate change and its ramifications appear to be conservative in their projections. This is because any phenomena that are not understood well enough to be represented in models with confidence are excluded. These other phenomena may accentuate or depress warming trends. In the case of the Arctic, most of the phenomena that have been excluded from the models are believed to accentuate warming and its effects. Few will depress it. The modeling on polar bear survival, for example, uses projections from the IPCC models to estimate future changes in sea ice extent. Since the bears’ condition is very dependent upon both the extent of the sea ice and the duration of ice-free periods, projections of the bear survival are very dependent upon projections of sea ice. This summer the sea ice extent is far less than projected by the models. The Center for Biological Diversity will appear to provide some advice on steps that can be taken to reduce warming, with particular emphasis on their efficacy in the Arctic. Among the steps they advocate are programs to reduce methane emissions and “black carbon.” Black carbon is soot that, in the Arctic, has a particularly pernicious effect. When it is deposited on snow and ice it decreases its reflectivity and increases its heat absorption leading to greater melting. As the Arctic comes under more and more industrialization with other warming, one could anticipate further production of black carbon. Methane is a powerful greenhouse gas, with an estimated global warming potential 23 times greater than carbon dioxide over a 100-year time frame. Methane is a precursor to tropospheric ozone. In that form, it traps shortwave radiation as it enters the earth’s atmosphere from the sun and then when it is reflected back again by snow and ice. As a consequence, its impact is strongest over the poles. Reducing global methane emissions would provide a particular benefit to the Arctic. 10:40: Juday They are self-reliant people, and their environment is changing. Pack ice should be present right about now, and they’re not able to be safely on the ice. The permafrost definitely is warming. The boreal forest is dying. Sea ice is retreating and thinning. 10:45: Haseltine Data shows a decline of about 10% per decade in sea ice extent. This year had about 40% less ice than 1979. There’s a growing scientific concern that sea ice has been pushed past a threshhold of catastrophic change. 10:51: Siegel The polar bear will likely be listed as endangered in the next year, but the listing won’t be enough to save the polar bear or the sea ice they depend on. The polar bear depends on sea ice. The situation for polar bears in a rapidly warming Arctic is grim. We know that business as usual cannot continue and we need to limit CO2 concentrations to below 450 PPM. Anything else we do may be futile if we don’t address this most important of greenhouse gases. By attacking methane and black carbon emissions we can have an immediate effect on the Arctic and give ourselves a chance to save the polar bear in the long term. According to conservative estimates of the EPA we can eliminate 70 million metric tons of CO2 equivalent methane with no-cost or cost-benefit actions. 11:04 AM: Rohrabacher Ms. Siegel, what’s your educational background? Siegel I got a degree in anthropology and and economics from Williams & Mary and I am an attorney. Rohrabacher I believe Jim Hansen has received a significant amount of money from George Soros. Has anyone on the panel received money from Mr. Soros? There’s no question the earth is undergoing a warming trend. The major question is whether this is caused by human activity, and then wheter we can arrogantly think we can reverse what nature… and we’re looking at the effects of this on polar bears. I remembed the predictions of dire and doom for caribou. The caribou population has dramatically expanded since we built the pipeline. Quite often we hear people with these dire predictions to accomplish other political ends. We know the ice cores and these things give us an understanding of range in the planet. Timothy Ball stated that ice cores show that temperature leads increases in CO2. Dr. Juday was mentioning how methane gas was bubbling up as the temperature increases. Seems to me you’re backing up Dr. Ball’s observation. Alley If I were to overpay and go into debt, I would also have to pay interest payments. We know that the historical variations in temperature are due to the earth’s orbit. The interest payments of CO2 must be included in our explanation of today’s observed warming. Rohrabacher I must admit I don’t understand a thing you said. Juday The only way to explain the trends. Something is dampening heat loss, not adding heat in the summer. Those are the characteristics of greenhouse gases. 11:14 AM Miller Dr. Hansen denies receiving money from Mr. Soros. He’s not here to defend himself, but we have a statement from him and we are entering it into the record. Juday We need to poke holes in the tundra and see if there’s charcoal in them. We’re seeing fires now; previous fires aren’t known to have existed, but we should check. 11:19 AM Rohrabacher I don’t have any scientists named Steve, but Patrick Michaels suggests that all the reports of melting ice on Greenland are exaggerated. Since Bill Clinton became President of the United States to get grants you had to say that global warming is caused by human beings. This senior senior scientist says that polar bear populations are increasing. Haseltine The 13 populations, in the reassessment we did, 5 are declining, 2 are depressed due to hunting, and none are increasing. I’m quoting from a study by Ian Serling, a senior polar bear scientist for Canada. Rohrabacher It was a lot warmer in Greenland and I don’t know how many polar bears there were then. I’m not sure if that’s the natural number of polar bears in the world we should have now than what we have today. We have only one degree warmer, and we have five times less volcanic activity, which would tend to make it warmer, not to mention sunspots, which would imply natural causes, not an SUV, not to mention the warming going on Mars and Jupiter. Juday I was the lead author in the Arctic climate assessment. I’d refer you to that if you’re interested in what happened when. You’ve brought up several different ideas and I’d offer to help you disentangle what happened and why. Alley Scientists bubble with ideas and you help pay for activities to assess what makes sense and not. The National Academy of Sciences have looked at volcanoes, sunspots, etc., and have come to a high degree of scientific certainty that humans are responsible for the current warming. You quoted a scientist who claimed scientists modify their positions to get funding and personally, I’m under oath. And I would never ever ever do that. I am not lying to you. 11:30: Siegel If we take action on methane and black carbon we could start to see results by 2009. Rohrabacher I’m surprised my staff hasn’t submitted that list yet. But here’s another respected scientist, William Grey suggests that so many people are invested in this, they’re scaring people to get more investment. How many polar bears were there 1000 years ago? Haseltine We don’t know how many, but we know they existed then. Rohrabacher We could assume there were fewer polar bears. What’s the natural number of polar bears? Haseltine I don’t know if there’s a “natural” number, there’s the number the habitat can support. Rohrabacher I think it’s wonderful seeing pictures of skinny polar bears, which then gives people the acceptance to regulate their lives the reality is 1000 years ago the polar bear population was totally different. What was the level of ice in Greenland 1000 years ago? Alley I am one of the authors of a report that will be coming out. We’re in the temperature range we were 1000 years ago. Rohrabacher It was dramatically warmer 1000 years ago and 8000 years go. Juday No. We are probably warmer than we were 1000 years ago. Miller I have one more question for Dr. Alley. You said the release of permafrost methane was a big hole in the IPCC modeling. Do you have a sense how big it could be? Alley If we humans build all our fossil fuel, the methane feedbacks are on the order of 10-30%. Juday If you burned up all of the readily accessible methane in the tundra it would double atmospheric CO2. 11:43 Miller Our hearing is now adjourned.